Antique Wicker Furniture, Wicker Wisdoms, Authentic Period Antique Wicker Furniture from Dovetail Antiques! Click Here to browse our ONLINE CATALOG! We welcome you to experience the pleasures of a by-gone era, the Golden Age of American antique wicker furniture. The designers and the craftsman of the Victorian era who skillfully created the exquisite, imaginative, romantic pieces of wicker furniture are being recognized today by leading authorities and museums to have contributed significantly to American decorative arts. Dovetail Antiques offer for sale a variety of styles of the highest quality, authentic period antique wicker furniture (circa 1870 – 1930) available in the marketplace today. We personally select each piece and carefully restore the piece to its original condition. Dovetail Antiques deals only with antique pieces of wicker that are useful, possess aesthetic value and are of investment quality. These pieces are truly a valuable and functional art form that will provide you with lasting enjoyment. We offer a fine selection of fancy Victorian wicker furniture. Most of our Victorian wicker furniture was made by Heywood Brothers and Company, Wakefield Rattan Company, or Heywood Brothers and Wakefield Company. Many of these rare wicker pieces retain their original natural finishes and sometimes retain their paper labels. Our selection of Art Deco style wicker includes several outstanding Heywood Brothers and Wakefield Company wicker parlor sets. We always have a variety of Heywood Brothers and Wakefield Company classic Bar Harbor style wicker furniture available. We offer a fine selection of extra large and comfortable Stick style wicker furniture. 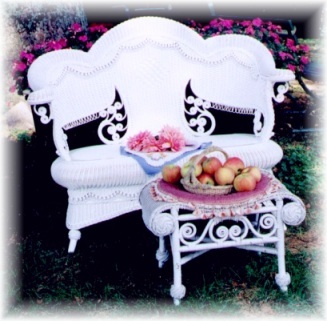 Dovetail Antiques offers top of the line professional antique wicker restoration services. Over 30 years of experience, personal service and the greatest attention to detail assure you of a topnotch restoration experience. We highly recommend using Benjamin Moore Paints for our wicker furniture. We offer custom paint color choices at no extra charge. Call or write us for details. Dovetail Antiques welcomes you to visit our online catalog of fine American antique wicker furniture. We offer a 100% satisfaction guarantee along with personal service and assistance in shipping. We hope you will enjoy our ever-changing column Wicker Wisdoms. In this column we touch on different aspects of antique wicker furniture that bring insight to a fascinating art form. We offer a glimpse into the past with a link to our collection of antique Victorian cabinet cards featuring fancy Victorian wicker props used by photographers. We also offer a link to our collection of old advertisements featuring wicker furniture. Our most recent link is a glimpse into the generations of our family that passionately pursued antiques throughout their lives. We hope you enjoy these links to the past. To shop now please visit our online catalog. If you are interested in specific pieces we are not currently offering, please let us know and we will send photos of the items when we locate them. Please call, write, or e-mail if you have any further questions. All pieces are subject to prior sale. Photos upon request. Several shipping options are available.